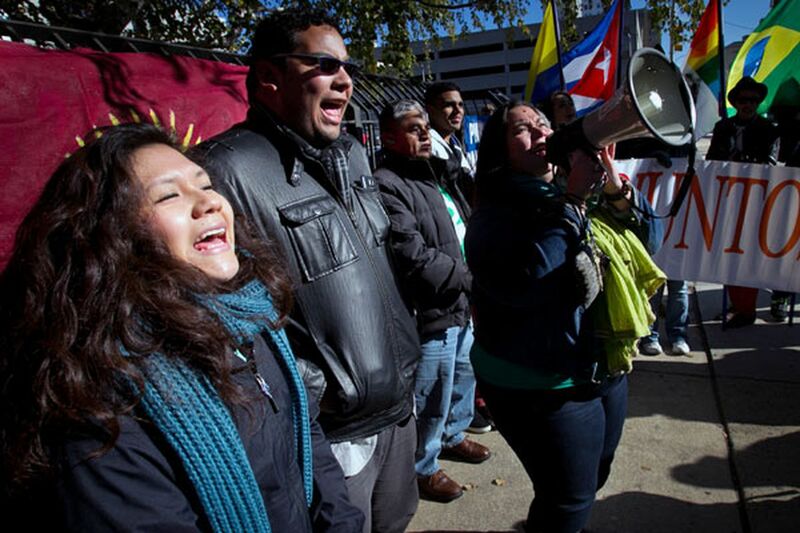 Juntos members (from left) Olivia Vasquez, Miguel Andrade and Erika Almiron during a rally outside immigration offices at North 16th and Callowhill streets on Friday, November 21, 2014. Washington's been talking about immigration a lot these days, but another capital should be, too: Harrisburg. In a few weeks, new policymakers will take office - from the Governor's Office to the General Assembly to scores of state agencies and departments - with a mandate to revive Pennsylvania's sluggish economy. Our state has some impressive resources to meet this challenge, but there's one that we could use a bit more of: immigrants. While the number of new Americans in the United States today is higher than ever, as a percentage of our total population we're still below the historic highs that marked the late 19th and early 20th century. What's more, the picture varies considerably by state, and Pennsylvania's is not especially bright. We rank near the top (sixth) among states by population but punch below our weight in our proportion of foreign-born to native-born, where we rank 24th or 29th (depending on whether estimates of undocumented immigrants are included). It's an irony for a state settled as a refuge, but when it comes to attracting immigrants, modern Pennsylvania is a laggard, not a leader. That's a problem. Immigrants, both temporary and permanent, fuel prosperity - for everyone. They improve the demographic ratio of workers to retirees, in turn improving the fiscal picture of governments. Immigrants - both new Americans and foreign visitors - add immense cash flow to the economy: In 2011-12, Pennsylvania's 33,000 foreign students alone spent $1.1 billion. And best of all, immigrants often drive the innovation that drives growth. They are, for example, more than twice as likely as nonimmigrants to start new businesses. So it's no wonder that over the past two decades, the large U.S. metropolitan areas with the greatest increase in immigrant ratios also had the fastest economic growth. That's why, even as Congress has stalled on comprehensive reform, smart state and local leaders from both parties have been busy: not arguing about legal status, but trying to actively attract more legal immigration, period. From New York to Chicago to California, savvy states and cities have been taking steps to make themselves magnets for immigration and claim a higher share of new arrivals. Although great efforts exist regionally in Philadelphia and in Pittsburgh, Pennsylvania as a state is not yet on this list. It should be. And there's plenty Harrisburg can do to attract more legal immigration into the Pennsylvania economy while we wait, fingers crossed, to see how the long-running Washington immigration saga finally ends. First, the incoming governor should issue a "Welcoming Proclamation" to advertise that our state is open to immigrants and their innovations. Second, Pennsylvania should join the 17 other states that have officially partnered with Welcoming America, a national nonprofit that works to promote mutual respect between the foreign-born and U.S.-born. Third, even in a tough budget climate, Pennsylvania should consider opening a state Office of New Americans, as New York, Michigan, and Illinois already have. Finally, Pennsylvania should create and implement a New Americans Plan, similar to the ones successfully used in Ohio and Chicago to attract and integrate immigrants. Taken together, these four steps would amount to a recruitment plan and nudge our share of U.S. immigrants higher. Improving that number is likely to improve another important number: the amount of wealth in the commonwealth. Comparing recent (2012) figures for states' total immigrant population ratios with their gross domestic product shows why. When the states are divided into five groups of 10, the 10 states with the highest proportion of all immigrants had average economic output of $55,600 per person. The 10 states with the lowest immigrant ratios had an average GDP of just $44,000, a whopping 26 percent difference. That pattern holds true down the line. Pennsylvania is in the third group, which had average GDP of $48,130, well below the high-producing top 10. True, correlation is not causation. But there's clearly a strong connection between more immigration and better economic performance. So moving the commonwealth up on the list of immigrant-friendly states can also help to move us up on the list of high-performing economies, and it should be high on Harrisburg's agenda to bring back real, widespread prosperity for all Pennsylvanians. As immigrants pursue their American dreams in Pennsylvania, they help to make the rest of us richer, too.